We have information you must know before you buy the Convertible. This car is currently selling below MSRP. Get up to $1,000 in incentives and rebates. There are 3 styles with incentives in your area. Your CarsDirect Trusted Dealer will help you find the best deal. 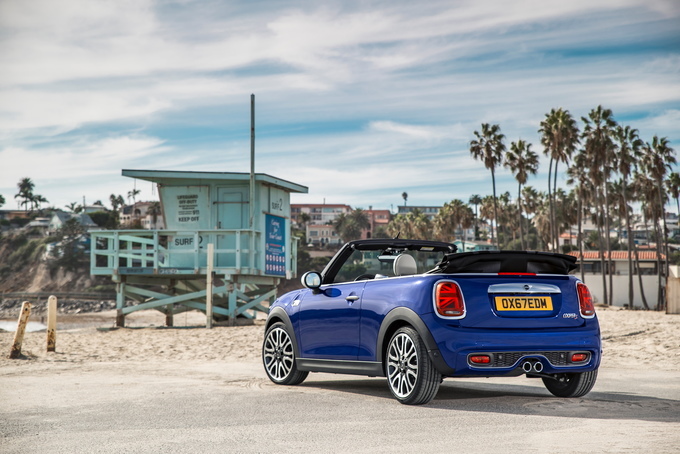 For those searching for a nimble drop top, the 2019 Mini Convertible should be on your radar. 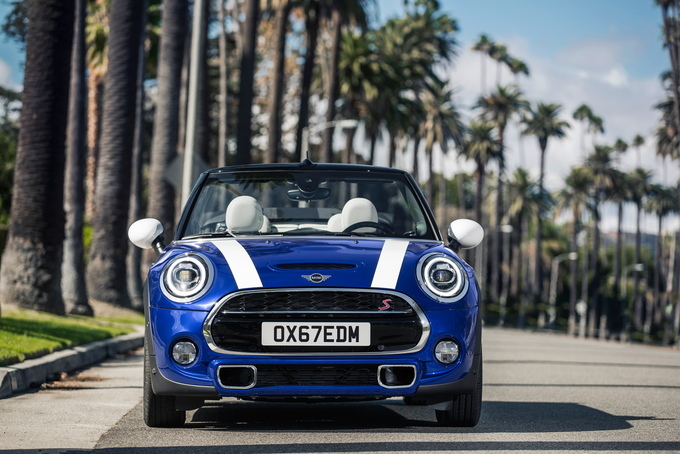 Starting at $27,550 (including an $850 destination charge), the 2019 Mini Convertible is offered as a two-door as a base, S, or in high-performance John Cooper Works guise. Similar in many ways to its hardtop sibling, the Convertible can now be configured in one of three sub-trims – Classic, Signature, and Iconic – although the a la carte goodness that's defined the Mini line remains and grand customizability remains. 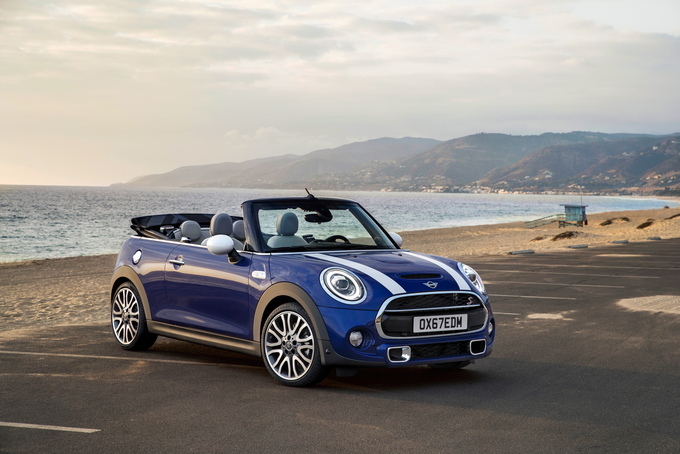 The 2019 Mini Cooper Convertible receives some fresh technology and minor exterior styling improvements as part of a mid-cycle update. The most noticeable change is the available Union Jack-inspired rear taillights, while lightweight alloy wheels, and an optional Piano Black color option have been added as well. Inside, the standard infotainment system has been improved to a 6.5-inch touchscreen that offers Bluetooth and USB interface, wireless device charging and an optional real-time navigation system. 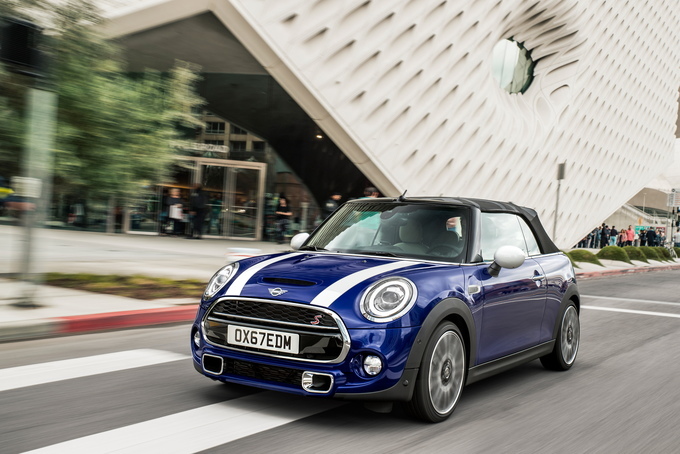 The 2019 Mini Cooper Convertible is mainly unchanged mechanically. 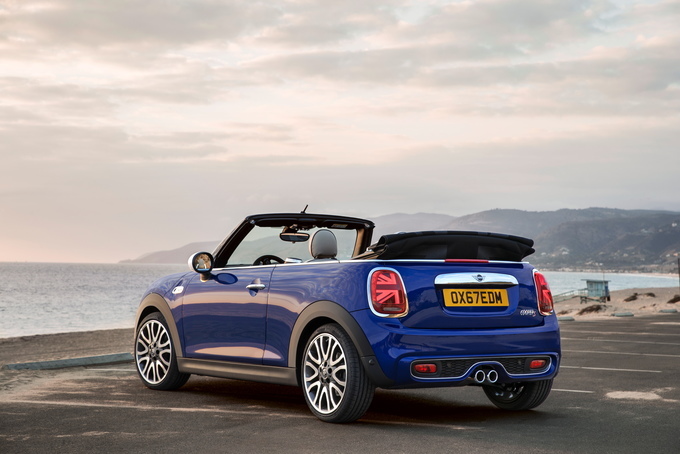 The 2019 Mini Convertible is available in three trims – the base Cooper, the Cooper S, and the high-performance John Cooper Works. Your decision here is based on what powertrain you're aching for. Base models use a turbocharged three-cylinder, while the Cooper S and JCW get 2.0-liter, turbocharged four-cylinders. 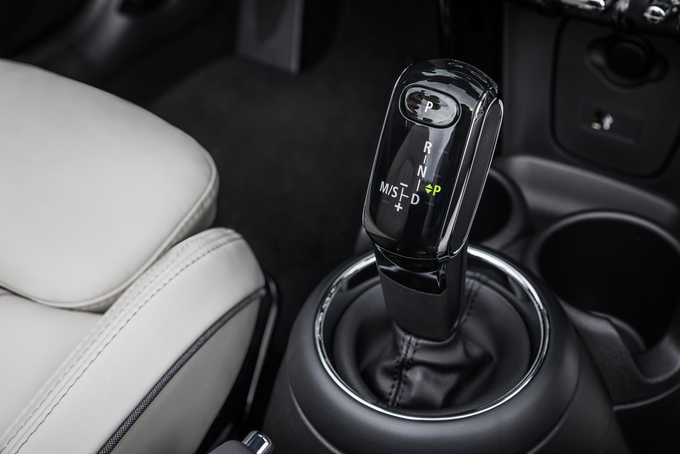 A six-speed manual transmission is standard in each, while a six-speed automatic is available for an additional $1,250. Once you've chosen an engine, it's time to choose a trim. 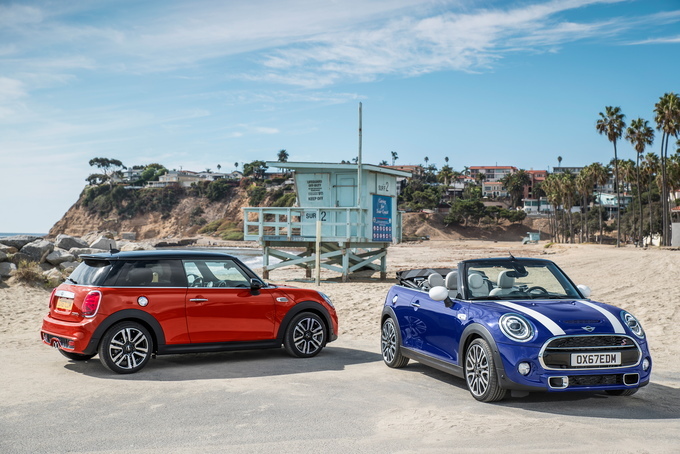 New for 2019, Mini is offering Classic, Signature, and Iconic trims for all three of its Convertible models. Since Mini hasn't released its online configurator for model year 2019, it's hard to tell if this is the end of the company's popular a la carte options structure, or merely something to make life easier on indecisive owners. The base Classic trim gets a standard rear-view camera, rear park distance control, and rain sensor windshield wipers on each. A 6.5-inch infotainment system is the only option here, while Classic owners are also limited to the no-cost Moonwalk Grey paint or the $500 options of Pepper White, Midnight Black, and Chili Red – Mini's iconic contrasting roof is not available on this trim. With the JCW, the Classic trim gains a JCW-branded leather steering wheel and sport seats. Swiveling LED headlights are also included with the JCW Classic trim. Moving up to the $3,000 Signature trim includes all the Classic features, as well as heated front seats, proximity entry, and a panoramic sunroof. Aside from the fancy Lapisluxury Blue paint, Mini's entire color palette is available for no additional charge on the Signature trim. This is where you'll want to start if you're intent on an automatic transmission – while it's a $1,250 option on the Classic, it's a no-cost feature on the Signature. The $8,000 Iconic trim what you'll need if you want the most luxurious Mini possible. Along with all the Classic and Signature features, it justifies its high price with a head-up display, the Premium Package (LED headlights and foglights, a Harmon Kardon audio system, auto-dimming exterior mirrors, and SiriusXM satellite radio), the Touchscreen Navigation Package (8.8-inch touchscreen with Apple CarPlay compatibility, navigation, real-time traffic, and a wireless charge pad), and an Upholstery Package that adds a selection of available leathers and upgraded interior trims. This trim also grants full access to Mini's attractive color palette. The 2019 Mini Cooper Convertible starts at $27,550. The base Cooper Convertible, like every other member of the Mini range, gets its power from a turbocharged 1.5-liter three-cylinder that produces 134 horsepower at 162 pound-feet of torque. Based on 2018 EPA-estimations, the three-cylinder with an automatic transmission (a $1,250 option) should return 27 miles per gallon city, and 35 mpg highway for a combined 30 mpg. The six-speed manual rates at 28/37/31 mpg. The base has 7.6 feet of cargo space with the top up, and 5.7 feet with the top down. In a departure from Minis of yesteryear, every option is not available from the get-go. If you stick with the base Classic equipment tier, your options are limited mainly to heated front seats, as well as the aforementioned automatic transmission and limited selection of paints. You'll need to move up to the Signature, where owners can swap out the 15-inch alloys for 16s, to add optional equipment. This mid-range trim really is the sweet spot – all three of the packages mentioned as standard on the Iconic are at least available on the Signature trim. All three – Premium, Touchscreen Navigation, and Upholstery – packages add $2,000 to the price tag. The Cooper Convertible S starts at $31,250 and receives a power upgrade via a turbocharged, 2.0-liter four-cylinder engine with 189 horsepower and 207 lb-ft of torque. It returns an EPA-estimated 23 mpg city, 32 mpg highway, and 26 combined with a manual gearbox – the automatic increases those figures to 25 city, 33 highway, and 28 combined. Unlike the Cooper, the Cooper S starts with 16-inch wheels on the Classic, offers up no-cost 17s on the Signature, and includes 18-inchers on the Iconic trim. The Cooper S' Signature trim is the first to come with forward collision warning with automatic emergency braking system. Other standard Cooper S features include automatic climate control, leatherette seats, a center armrest, and a leather sport steering wheel. The John Cooper Works Convertible starts at $37,750. The high-performance JCW Convertible is powered by the 2.0-liter, four-cylinder engine as the Cooper S, but output is up to 228 horsepower and 236 lb-ft of torque. When choosing the performance-based JCW, the fuel economy ratings fall to a 22 city, 31 highway, and 25 combined with the manual or 25 city, 33 highway, and 28 combined mpg. The Classic trim for the JCW comes equipped with a JCW-specific leather steering wheel, JCW sport seats, standard 17-inch wheels, and a sport suspension. 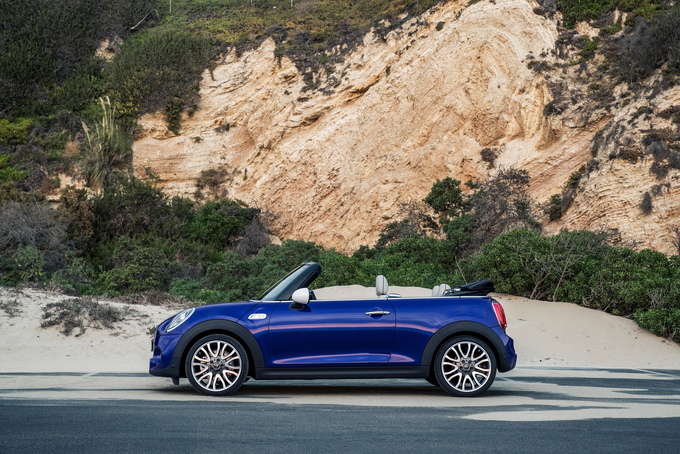 The Cooper S Convertible with the Signature trim is the best blend of performance, customizability, and price. Available packages abound, while the color palette is the most expressive. And the 2.0-liter, turbocharged four-cylinder is much more potent than the base engine but is a better value than the JCW. Undeniably British. Few vehicles are as stylish or as good looking as the 2019 Mini Convertible. 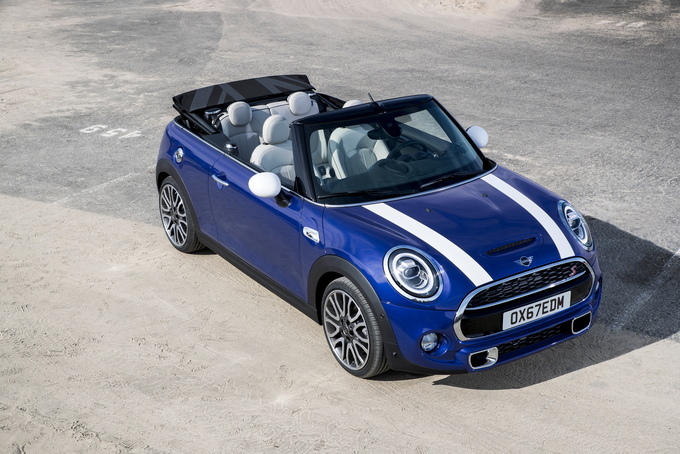 While it still maintains some of the magic from the classic model from years ago, the Mini Convertible has been updated along the way for a fresh, modern look. A new Mini badge, Union Jack patterns in the taillights, new 17-inch wheels, and a trio of exterior paint schemes are new for 2019. Mini has always said that the Cooper looks like a Bulldog and we're inclined to agree. Low, round, and full of bulges, the Mini Convertible does indeed look like a muscular dog that's sitting. The unashamed British touches also highlight the model's rich heritage. Good cornering abilities. The short footprint that's so unique on the outside also translates to the way the Mini Convertible handles corners. Grippy tires, direct steering, and a lightweight design really help the car shine when the road gets twisty. The car's stability control system also lets you have the right amount of fun without being too intrusive. Great fuel economy. Fuel economy isn't where convertibles usually shine, but the Mini Convertible is one of the few vehicles that lets you enjoy good weather without requiring you to constantly fill up at gas stations. When properly equipped, the Mini Convertible is rated to get an EPA-estimated 28 miles per gallon city, 37 mpg highway, and 31 combined. Cramped cabin. While the Mini Convertible has grown larger every year, the interior still isn't spacious. Sure, the driver and the passenger in the front and treated to a great amount of head room and leg room, but the passengers in the back are in for a rough time. Two seats may be available in the back, but they're better left for kids or as extra storage. 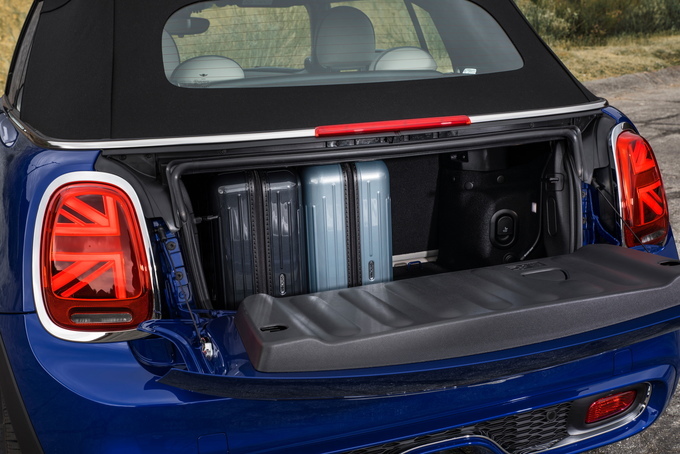 Cargo space isn't stellar for the Mini Convertible, either. The trunk is only rated to hold up to 7.6 cubic feet of cargo with the top up, while that figure shrinks to 5.7 cubic feet with the roof stowed away. Final thoughts. As a second car that's all about being fun to drive and lighthearted, the 2019 Mini Convertible hits all of the right notes. It's handsome, fun to drive, and has a great list of available features. The trunk may be small, but when you're having so much fun on a Sunday cruise, does that really matter? We would have been content with the Mini Convertible's good fuel economy, but having great performance – especially in the available John Cooper Works trim – is something that really separates the model from other convertibles on the market. The only thing we're left wanting is more cargo space. Even if it were just a tiny bit more. The Mini Convertible doesn't have a lot of competition. If you're looking for something much sportier, there's the Mazda MX-5 Miata. The Volkswagen Beetle Convertible has bespoke styling and a cabin that's slightly more spacious. We have partnered with trusted dealers in your area to give you a great price on the new MINI Convertible.